There any number of reasons you might want to record what you can hear from your Mac’s speakers, grab that radio show, record that Skype conversation or capture audio for a screen cast. The sublime interface adds makes it a joy to use. 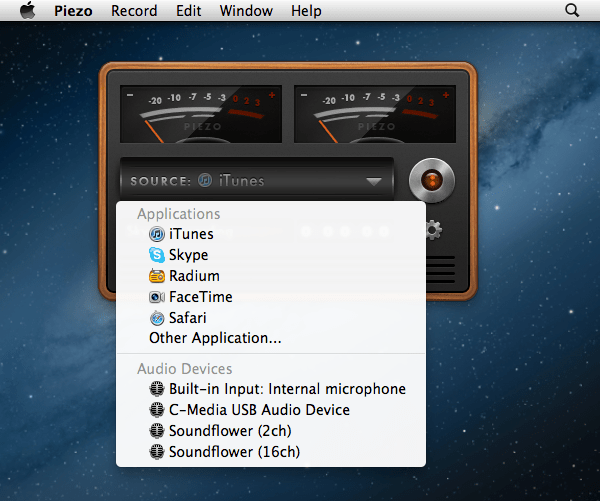 Piezo takes the hassle out of recording audio conversation in a refreshingly simple audio recording application. Piezo is from the good people over at Rogue Amoeba who you may of come across before for their other recording application, Audio Hijack pro. Capable of recording much more than just a Skype conversations, pretty much any application that generates audio can be captured with this application following the golden rules of do something and do it well. The feature list is extensive as you can see from the programs website yet it doesn’t tread on the toes of it’s bigger sibling, Audio Hijack Pro in an overly obvious manner. I’m glad they took the approach of designing a program that gives you more than enough to work with but keeps the dangling carrot of upgrading in sight but not too obvious. 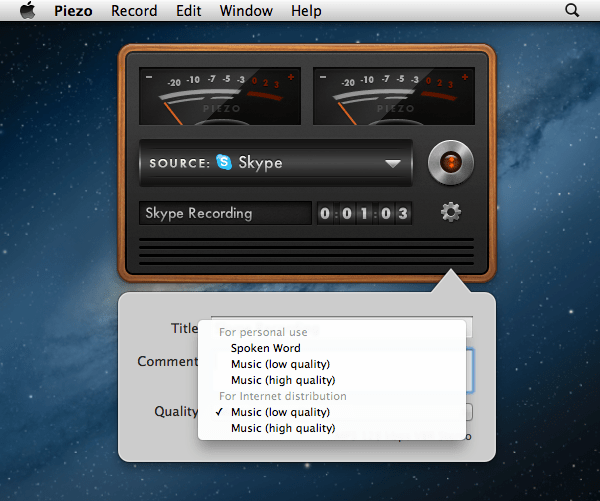 Piezo can record audio from almost any source but you will need to relaunch the application selected in the drop down window. The ability to capture audio from applications without having to relaunch them is found in audio hijack pro. Recording is a process of click to start, click to stop and aside from changing the title of the recording or adding comments that’s pretty much all the interaction that happens with this application. Simple yet incredibly handy. 5 pre-sets are included for recording to get you up and running but these are hardcoded with no ability to change or edit them. Once again this points to the dangling carrot of upgrading to Audio Hijack Pro for those features. That being said the pre sets included are ok and if you aren’t sure, just choose the highest one on the list if you are taking it into garageband etc. Sound levels are application controlled not system controlled meaning that increasing the volume in the system bar doesn’t affect anything. Recordings are stereo broken down into left and right channels and the vu meters are responsive giving a helping hand on setting up your levels. If you’re recording a Skype phone call the left channel is the person recording the conversation and on the right channel is the person on the other end. As everyone in the world seemed to be asleep at the time of writing I called upon the dulcet tones of the Skype call assistant. For those of you brave enough to risk hearing my voice, here’s a sample recording. 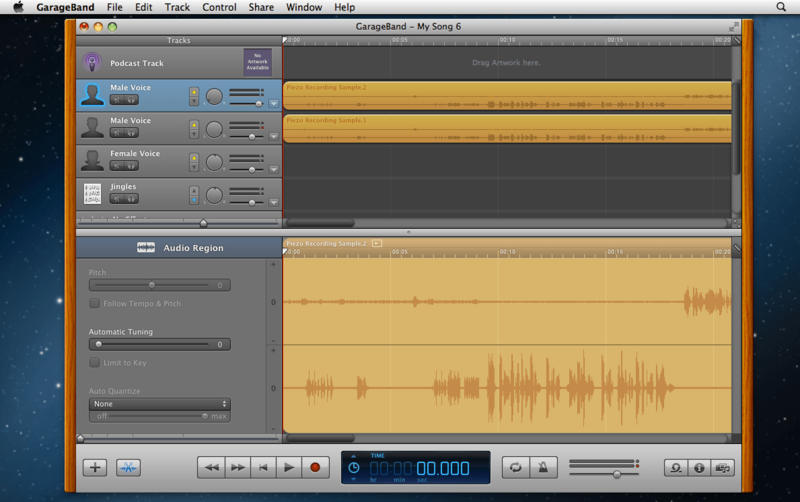 For those more familiar with garage band than myself you can split the stereo track if looking to produce a podcast or similar. 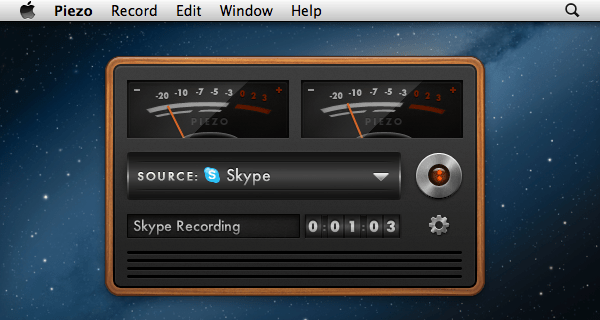 You can see in the above image I need to work on setting up levels before recording a Skype phone call. version 1.1.5 is released fixing a bug where high cpu usage could cause problems with some captured apps. We didn’t get this on the review copy that we have but it’s always nice to see app’s getting updated in such a timely manner.